Floyd Mayweather Wins Boxing Match… WITH A SUCKER PUNCH!! 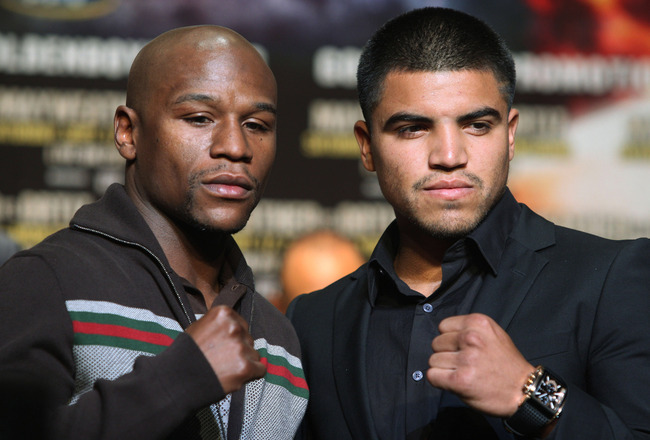 Floyd Mayweather has won the boxing match against his opponent Victor Ortiz. How did he win in a mere 2 mins and something seconds? With a sucker punch!! Due to the reaction of Ortiz they penalized him for a headbutt. Ortiz apologized to Mayweather for what happened and as the apology was going down Mayweather was planning for a way for Otriz to go down. Ortiz took the 1st punch because he felt like he deserve it. The 2nd punch was what we here in Miami call a Bi*ch move. The social networks are going bananas and Mayweather is getting boo’d. As the fight ended and Mayweather was getting interviewed he did not answer any of the questions the reporter asked instead he told him that HBO needs to fire him and that he knows nothing about boxing HOW RUDE! IN THE END THIS WAS A VERY WACK FIGHT IM SORRY TO EVERYONE WHO PAID FOR THEIR PAPERVIEW FOR 15 MIN!